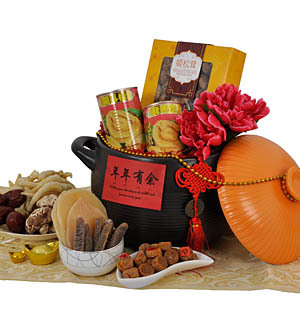 Vivid future for the new year in a Fuyou Premium Claypot 4.2L. Premium Australian Dragon Horse Abalone (鲍鱼) 425g x 2, Premium Scallops (上等干贝) 125g, Dried Sea Cucumber (海参) 400g, Abalone Slice ((鲍鱼片) 170g, Fish Maw (鱼鳔) 100g, Himematsutake Mushroom (姫松茸) 120g, Premium Flower Mushroom (花菇) 125g and Jumbo Red Dates (红枣) 100g. Fuyou Claypot complies with the Japanese Health Food Association & can withstand up to a temperature 700 C. This multipurpose claypot can be used on direct flame, electric burner, oven and microwave oven for boiling, steaming, frying, braising, barbecuing, stewing and many more. As the pot has been elegantly designed, it can also serve as a casserole and sits well on most table setting.